Intercostal nerve block; what you need to know? Feb 14 Comments Off on Intercostal nerve block; what you need to know? The 29-year-old had idea he’d fend off from the sports car crash with only bruising, but a CT scan yesterday unveiled four fractured ribs. “After a few laps in my friend’s car I thought I’d be alright and I just woke up this morning a lot terrible,” Walsh explained. “I hardly slept and at 3 am, I concluded, I can’t do this. It’s more terrible than ever, I was on pain killers and it wasn’t easing. I have been taking plenty of rest from the last weeks, but getting up and doing routinely activities or driving and then rest making it extremely uncomfortable” thanks to Dr. Zaki Anwer, MD, at The Pain Management Institute who introduced intercostal nerve block and helped me get back to competition. An intercostal nerve block is an injection of medication that assists in relieving chest pain caused by rib fracture resulting from sudden injuries, tragic accidents and shingles. The intercostal nerves are found under each rib, when any of the nerves or tissues encircling get damaged or inflamed, it causes severe pain. 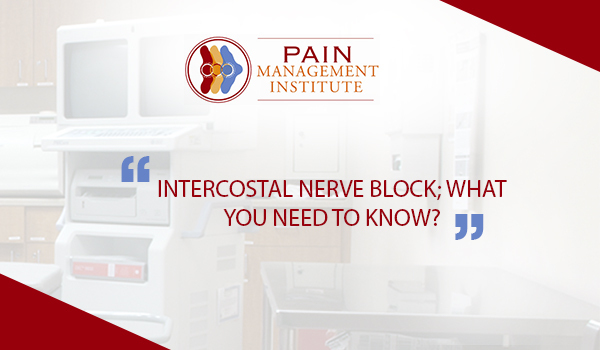 Dr. Zaki Anwer, MD, explains the intercostal nerve block procedure At Pain Management Institute. My patient’s comfort is my primary concern, I will give an Intravenous medication to relax, then you’ll lie on your side, the one not causing pain. I will use an antiseptic solution to clean an area of the skin where the injection will be given. Talking about the post procedure outcomes and pain reduction after the injection Dr. Zaki Anwer, MD, elucidates, some patients experience pain relief immediately after the injections, but the pain may return a few hours later as the anesthesia fades.